I have to tell you about a great opportunity I got. I was chosen to get an advanced copy of Leanne Shirtliffe’s book Don’t Lick the Minivan and other things I never thought I’d say to my kids. Leanne blogs at Ironic Mom (www.ironicmom.com) and has written for the likes of Breakfast Television, Citi-TV Calagary, The Huffington Post and The Calgary Herald, and many more. When she put out a call for anyone who wanted to read the book, I raised my hand really high….okay, I sent her an email. And I feel lucky to have been chosen as a lucky advanced reader, and for this amazing chance to work with her. And the book is amazing. 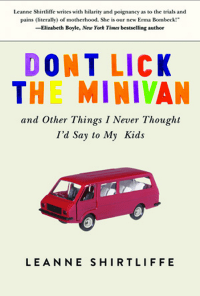 Don’t Lick the Minivan is clever, well-written and the kind of book any parent can relate to, regardless of how many kids you have. Her tale of pregnancy and all the worries and woes that go along with it, seem heightened in a land far away, and the fact that she was carrying multiples. The time and place don’t matter though, as all pregnant women worry about the same type of things. Leanne just had the nerve to write them down! We get to go along for the ride of the birth of her twins, surviving the humidity of Thailand her journey back to surviving Canadian winters and more. I laughed out loud many times. It is her story of the strange and crazy things that kids do. Her honest perspective on parenting leaves you feeling like you’re not alone. As parents, I think we all have fear that we are raising monsters and have anxiety of the germs that can attack said monsters at any time. But it is the realization that the solid foundation of love and family really do mean everything. Throw in a set of rambunctious twins and a minivan, and it’s a recipe for a great book! A definite read for parents to kids of any age! I’m grateful I had the opportunity to read the book in advance of the in-store release date. I highly recommend it! It’s not your typical parenting book and it will have you in stitches. Don’t Lick the Minivan and other things I never thought I’d say to my kids by Leanne Shirtliffe is available for pre-order at Indigo, Amazon and Barnes and Nobel. Go get it!